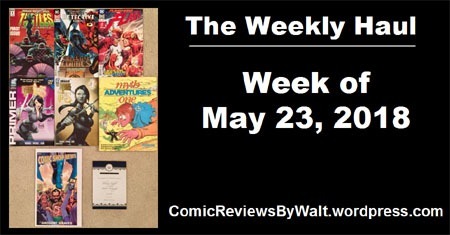 This week proved to be a rather small week comic-wise, which allowed for me to make a purchase I’d eyed last week but held off on financially. 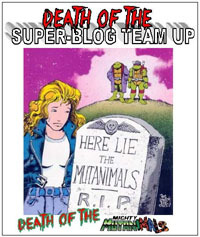 First off, IDW is reprinting the original Image run of Teenage Mutant Ninja Turtles under the subtitle Urban Legends. This is a sort of “forgotten volume” a la Devil’s Due‘s GI Joe series, itself having been reprinted some years back under the Disavowed subtitle. Per usual, the TMNT are an exception to my usual rules for pretty much anything/everything comics–I will “double-dip” at least on this first issue, eventually going with both the A and the B covers–the B covers apparently being the “original” cover images. Since the rest of the Color Classics had the “original” cover image, if nothing else, it might simply be my exception by way of me actually going for the B covers where the rest of the time I try to go exclusively with the A cover. From what I can tell, this week’s Detective Comics caps the Rebirth run on the title, and I think the title passes to (a) new creative team(s) with the next issue and going forward. As such this might be my last issue until #1000 as I’m so far behind reading anyway that I’d just as soon wait for collected volumes until then, but already had enough of this run to want to keep going, and having assumed the creative team was going to be on the book longer. And we finally have the start of The Flash War, which I “should have” passed on, but figured I’d get even though I’m far behind on reading Flash stuff, and actually had finally “let the title go” when this story was hyped a bit but didn’t actually materialize! Now it’s here, but I might wait for the collected edition for anything past this issue. I picked up the Executive Assistant Iris Primer and the new #1 on being 25 cents and writer Blake Northcott‘s name, respectively. I don’t remember if I knew she would be writing this, and certainly didn’t remember or recognize that it was going to be out this week… a well-timed post on Twitter Tuesday (or maybe Wednesday morning–I can’t actually remember and it’s not important enough to go look it up) put it on my radar. AND since the “A” cover was available, rather than a B or any OTHER cover. And though I’d seen it last week, I passed on Myth Adventures One. But having the week to consider, and this week being a smaller week, for the price of 2 1/2 standard-price comics, I got this graphic novel edition–33ish years old–collecting the first four issues (and in color!) of Myth Adventures. (And as I said regarding my purchase of the single issue #10 back in March, I must blame fellow blogger Michael Carlyle, writer of The Crapbox of Son of Cthulu firstly for “inspiration” to get that issue, and then his recommendation of the series that helped prompt this purchase). I also like that its size should be a nice match to the original TMNT color editions. Finally, this week’s CSN and a checklist for the issues leading to/including the Bat-Wedding and Catwoman #1 this summer. 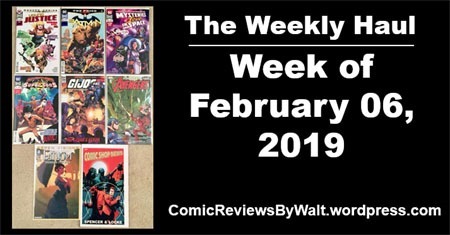 All in all, I feel like this is one of the highest-quality weeks for me in awhile; with most of the issues being stuff I can/will dive right into reading. First issues/primers/start of stuff, and even the Detective Comics issue I’ll probably read despite not being current with reading the series…like losing track of a tv show but watching the finale to at least have that experience rather than trying to avoid spoilers or being spoiled without context of the episode/issue itself. I believe next week (finally!) kicks off the new Man of Steel weekly, and I’ve yet to decide if I’m going “all in” on the Bat-Wedding stuff or if I’m just sticking with the core Batman title, as I know the tie-ins will be a collected edition in several months. 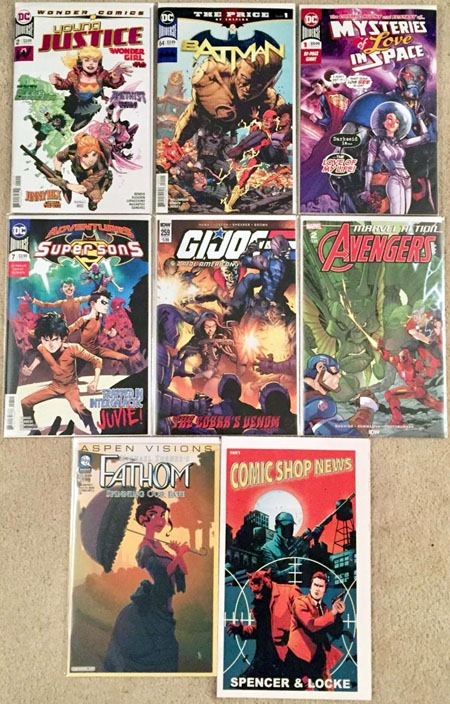 This week was not a tiny week, nor a huge week…but did have one issue in particular I’ve been looking forward to for awhile, another I was curious about and bought grudgingly despite variant covers. Plus some extras, and an Image vol. 1. I’ve been anticipating Super Sons for several months now, and though somewhat initially disappointed at it not being out last fall, was glad for time to be given to letting the characters/situation develop a bit more before rushing the title out. And I’m curious about The Wildstorm, but nearly passed on the first issue entirely due to no less than three apparently "equal ratio" variant covers, none of which seemed necessarily "iconic" or recognizeable. 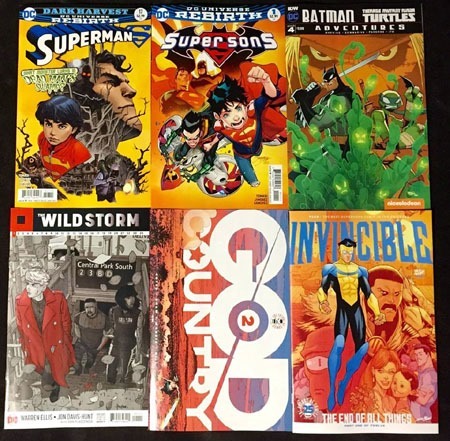 Then there’s the regular Superman issue; the fun Batman/TMNT Adventures, giving the second issue of God Country a chance, and not about to pass up a 25-cent issue (Invincible). 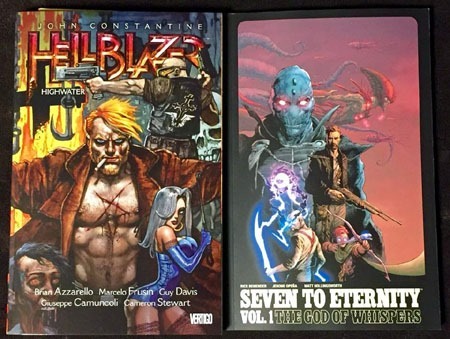 On Tuesday, taking Carol & John’s up on their Feb. 14th promotion, I stopped in, and wound up purchasing the most recent Hellblazer volume. 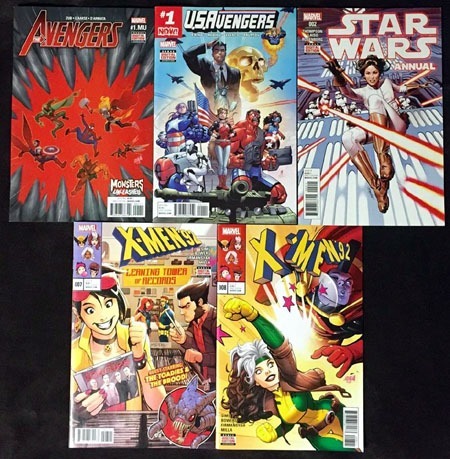 For my "prize," I got to choose five Marvel single issues. Figured I’d give the first couple a shot; the Star Wars Annual seemed an especially good "value" for being "free," and though I"d let the series go, I’m not opposed to "completing" a run of the short-lived X-Men ’92 series (now only missing 4 issues or so). And though I’d somewhat intended to buy the first paperback of the current Action Comics run, Superman: Path of Doom…flipping through the volume, I just couldn’t bring myself to buy it. $17 for 6 issues I already have, the first issue in print and digital, and handy. Plus, no bonus content, no "introduction" or "afterward" or such…just another 6-issue "graphic novel." So I opted to snag Seven to Eternity vol. 1…same or larger thickness, and $7 cheaper. 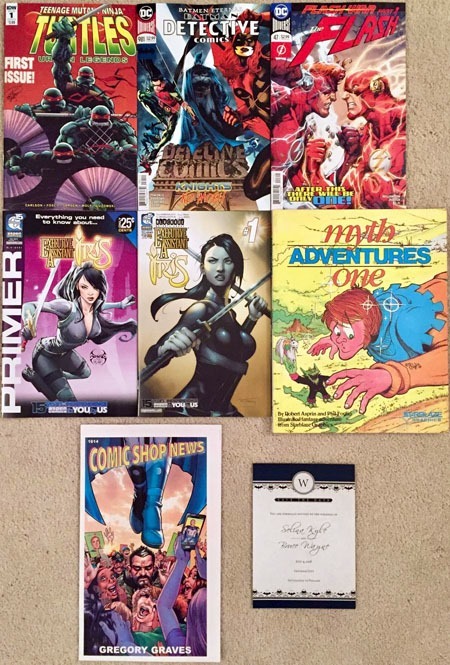 Since I didn’t get around to posting it last week with rushing my All New Fathom #1 review, and the original got bumped for timing this week, below is my Weekly Haul post of stuff from from last week. I don’t usually go for comics like this. I’m not a fan of these scantily-clad female leads, running around in bathing suits and–from the outside looking in–seeming to be more flash than substance. But, having followed the writer on social media for a number of years, I’d decided when it was announced that she’d be writing a new iteration of the series, I’d at least check it out…all the more as a female such character in this case being written BY a female, and not just another book to be lumped together, written by a guy about some visual/eye candy. I then managed to forget the thing was due out this week, until–via social media–I saw her post about it being out, which brought it back to my attention…and I was ok with paying out $3.99 for the issue, as it’s at least NOT DC or Marvel and all that. So what did I wind up with, for that $3.99? For one thing, I felt like this was a lengthy read. I did not feel like I just turned a couple pages and was at some to-be-continued or like the issue was too short. 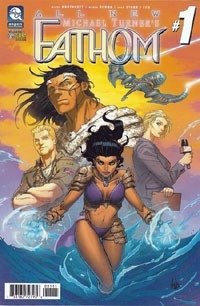 I had no idea what to expect, really…having never (That I can recall) read an entire issue of Fathom or Soulfire or such. The opening page puts us right into the heart of the action, as our heroine–Aspen–is mega-uppercut-punched out of the ocean into the coastal city and does battle with the guy doing the punching. While she fights him–and his mysterious weapon, trying to keep any civilians from being killed–we learn that the narration is from AFTER the battle (so she won), telling her friend about the fight. Finally, she reveals what she’s learned about the mysterious weapon that had been used against her, and how that plays into stuff going forward. I wasn’t overly impressed with the cover, as I’m not really familiar with even the title character, let alone any supporting cast (new OR long-since-established). The main cover’s not bad, but seems rather generic to me (as opposed to indicating the battle that took place in the issue). Visually, the issue felt like what I would expect from "an Aspen book" even if I can’t quite quantify what that is, exactly…except that I suppose this looks like it belongs with or fits right in with prior books from the publisher, and so does not look like an oddball or out of place piece that happens to be published by Aspen. The characters all look quite believable, and as much as is possible for a woman basically in a bathing suit, I felt like the issue avoided unnecessary or overly-gratuitous imagery…I didn’t feel "dirty" paging through the issue! I was also reminded a bit of Witchblade, and will be interested to see how coincidental (or not, or far off) that works out to be in coming issues. Story-wise, I enjoyed how down-to-earth this felt. I figured as a #1 issue, new series and new story, this would feel like just some opening chapter, and just throw a bunch of introductory stuff at me and leave me not really knowing what the heck was going on. However, I found that I got a complete story, really, even as stuff is thrown wide open for subsequent issues! We’re introduced to the title character, her situation, others involved with her, a bit about her background/where she comes from, while seeing the character in action and interacting with her friend. There’s a healthy dose of real-world commentary…particularly in "seeing" how the character is reacted to across various media. Ultimately, I just enjoyed this issue, and I’m quite glad that I bought it. I checked it out solely based on the writer, and I’m left with an honest interest in getting the next issue to see how things play out. While it by no means gets into over a decade of "history" with the title character and such, this is still an excellent jumping on point, and one of the stronger, most complete and worthwhile first issues I’ve read in quite awhile. If you’re a fan of Blake Northcott‘s writing, or Aspen (the character), or the publisher or such, I suspect this will be a fitting bit of enjoyment as well. I’m looking forward to the next issue, and seeing how stuff advances and continues to play out!